Rich & moist, chocolate banana muffins with dried cherries and bittersweet chocolate. 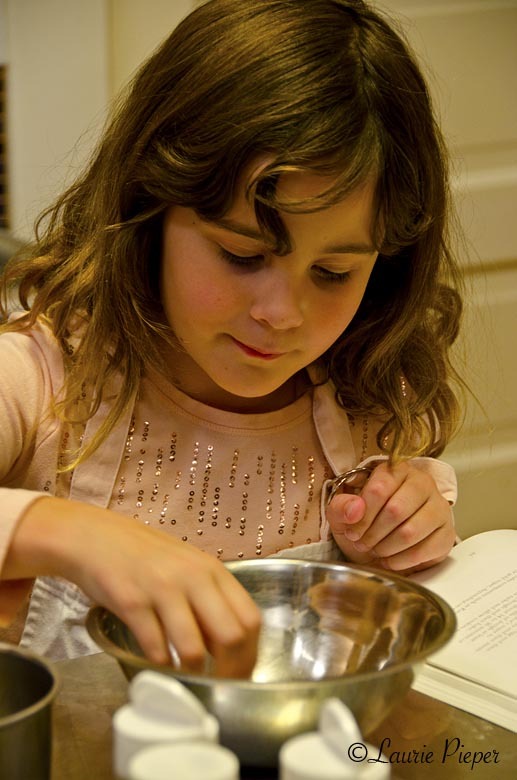 2 T. confectioner’s sugar, stirred together with a pinch of cinnamon. 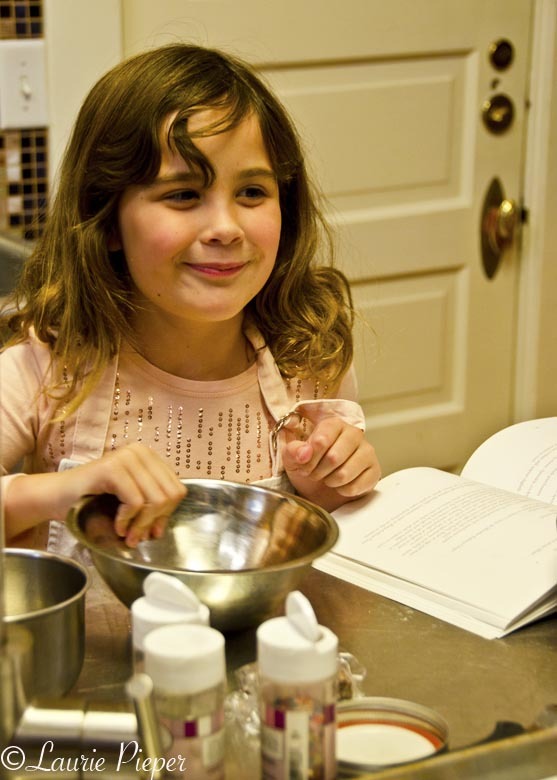 In a large bowl, whisk together flour, granulated sugar, cocoa, baking powder, cinnamon and baking soda. Set aside. In a medium bowl, beat together banana, butter, and buttermilk. Stir wet ingredients into dry ingredients until no dry spots show. Fold in cherries and broken chocolate. Spoon batter into muffin molds. Smooth tops with the back of a spoon. Bake for about 22 minutes or until muffins are firm to the touch. Available through Wilton and speciality baking supply companies. May your heart be full of happiness this Valentine’s Day! 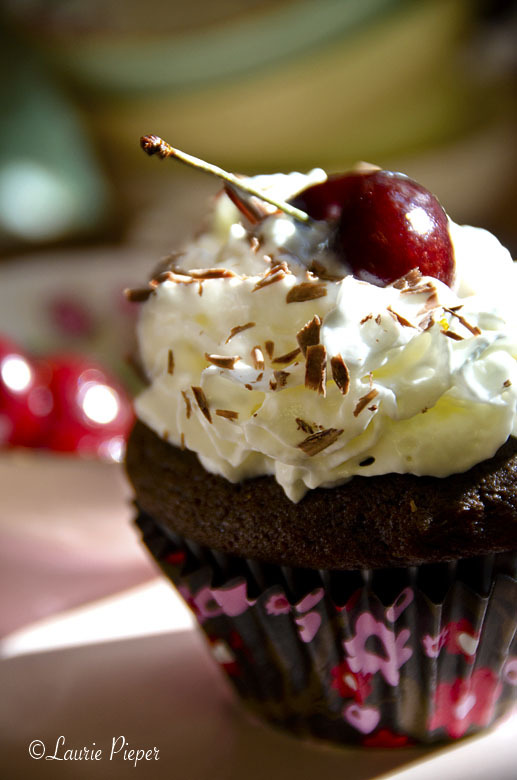 These light-textured chocolate cupcakes, served with whipped cream and cherries, are really fun for guests. An added bonus is that you can make the cupcakes ahead of time and freeze them until you have company. Just thaw, top with whipped cream, garnish and serve! Ready to start thinking about Valentine’s Day? Sift together flour, cocoa, baking soda and salt into medium size bowl. Set aside. In a small bowl, lightly beat together milk, eggs and cherry liqueur. Set aside. In a large bowl, beat together butter and sugars on high speed until light and fluffy. Scrape down sides of bowl. On low speed, beat in 1/3 of the flour mixture. Scrape sides. On medium speed, beat in 1/2 of wet ingredients. Scrape sides. Repeat, beating in 1/3 of flour mixture, remaining 1/2 of wet ingredients, and then remaining 1/3 of flour mixture, scraping down sides of the bowl in between. Mix together chopped cherries and chocolate and then fold them into the cupcake batter. Divide batter equally between muffin cups. Cups should be about 3/4 full. Bake for 20 – 25 minutes or until no wet spots appear on muffin tops and muffins are firm to the touch. Do not overbake. Place muffin pans on baking racks for 15 minutes, then remove muffins, and place them on racks to finish cooling. To serve, top with whipped cream, grated chocolate and a fresh cherry. * If you need to, you can substitute natural cocoa, but Dutch-process has better flavor in this recipe. ** I use plain white papers for baking, then slip the muffins into decorative papers or foils for serving. 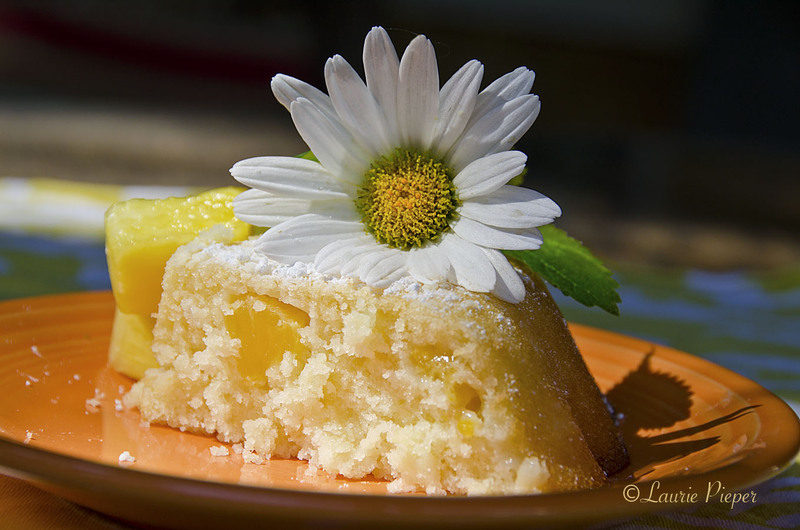 I recently came across a recipe for Cornish Hevva cake on FrugalFeeding.com and thought that it looked delicious and also that it sounded like it had an interesting history behind it. I loved the image of the fisherman’s housewives starting to bake as soon as the lookout called that their husbands were returning home. So I made a mental note to give “the cake” a try sometime. I made a gluten-free version which produces a sweet, crumbly biscuit. 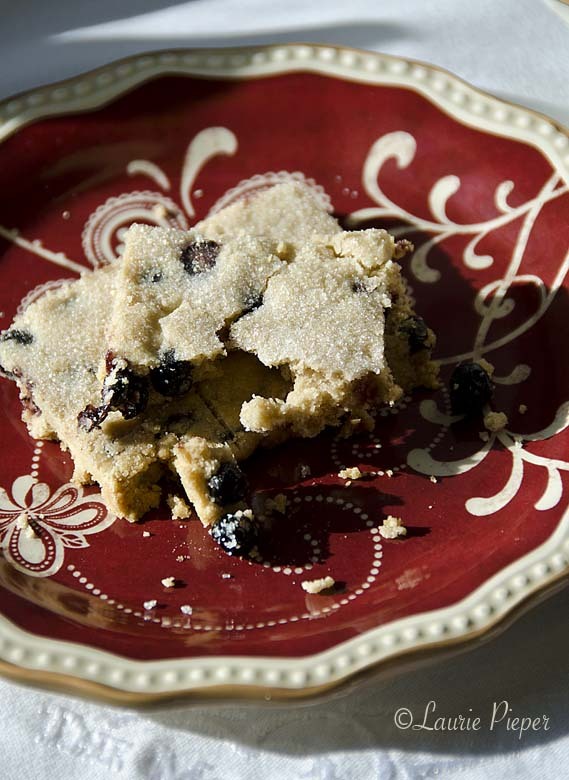 It reminded me of a very thin version of Scottish shortbread with dried fruit. It went very nicely with a glass of milk – for my first piece, which I ate before it had any time to cool – and also with a cup of tea later on. 1. Preheat oven to 375 degrees F. Butter a large baking sheet. 2. Whisk together flour, 1/4 c. of the sugar, cinnamon, ginger and salt. 3. Using your hands, work butter into dry ingredients. 5. Scrape sides of bowl and transfer the dough to the center of the greased baking sheet. Lightly pat into a disk, then roll out to just under 1/2-inch thick. 6. Using a paring knife, score the top of the dough to resemble a fishing net. Sprinkle with a little more sugar. 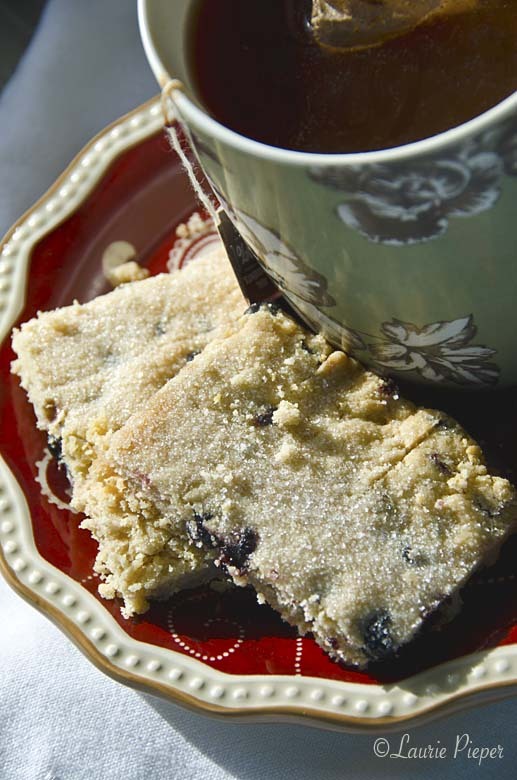 • I substituted dried blueberries for currants, because I was out of currants. • I substituted gluten-free flour (Glutino brand gluten-free all-purpose flour) for the plain flour, because I wanted a gluten-free version. 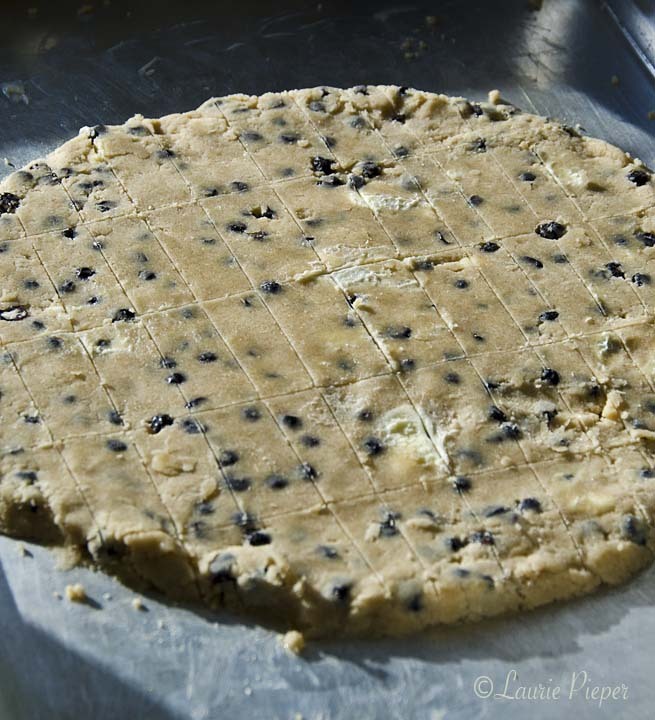 • Nick’s directions call for rolling the dough out on a floured surface, then transferring the dough to a greased baking sheet. I just rolled it out directly on the greased baking sheet. I wasn’t sure that I wanted to mix in any more flour since I had used a substitution and wasn’t sure how that would affect the recipe. • I sprinkled the sugar on before baking because I thought that would work fine. 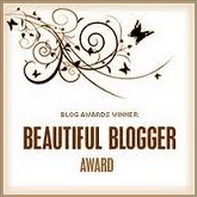 • I forgot to cut the pieces on the diagonal for serving. Old habits. I’ve made a mental note to correct that next time – but the biscuits were still delicious! • I think that American cooks can probably go ahead and use the whole 8 T. of butter that come in a stick. I weighed ingredients to convert from metric measurements and the butter measure came to 7 T. plus 1 t. For my first time making the recipe I wanted to stick to the original measures. If using 8 whole tablespoons of butter, one could probably also use a full 1 1/3 cup of flour. I’ll try that next time. Thanks for introducing me to Hevva Cake, Nick! When baking an assortment of cookies for the holidays, it is nice to have both a variety of shapes and of flavors. Mexican Wedding Cookies are small, buttery, nut cookies, rolled in sugar that provide a contrast to drop cookies and to cut-out cookies in shape and provide contrast to chocolatey and to fruity cookies in flavor. This version, with spices mixed into the rolling sugar is both flavorful and aromatic. I made this batch last night and loved the way that they made the kitchen smell. 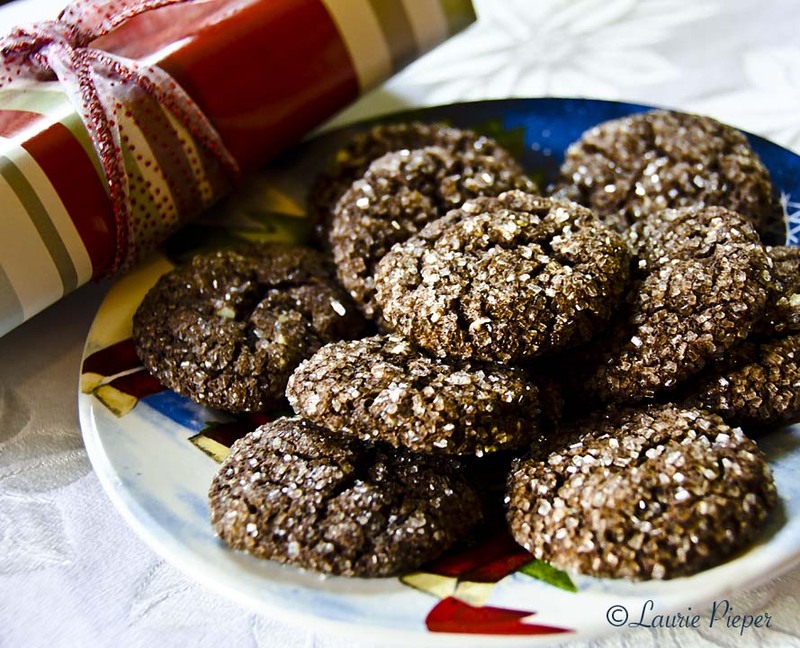 Added bonuses are that these cookies are easy to make keep well for gift-giving. Enjoy! 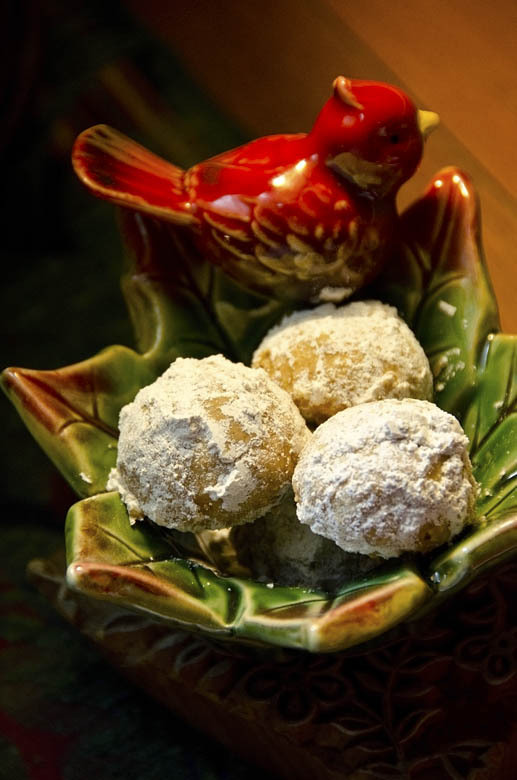 Mexican Wedding Cookies – also known as Russian Tea Cakes, Italian Tea Cakes, Snowball Cookies, and Butter Balls, and probably a dozen other names – are a traditional Christmas cookie in the United States. They are buttery cookies made with ground nuts, baked, and then rolled in confectioner’s sugar. In this version, aromatic cinnamon and cloves are added to the sugar. Preheat oven to 375 degrees F. Line 2 baking sheets with parchment paper. In large bowl, beat butter until light and fluffy. Beat in 2 T. of the confectioner’s sugar and the vanilla extract. On lowest speed, beat in flour and then nuts. The mixture will be very crumbly. Spoon a small about (about 1 heaping teaspoon) of mixture into one of your palms. Squeeze lightly until the mixture holds together then shape into a ball. Place on baking sheet. Repeat with remaining mixture, spacing the balls well apart on the 2 baking sheets. Bake for about 11 to 13 minutes or until cookies are lightly browned on the bottom. The tops of the cookies will be very pale. Place baking sheets on wire racks and allow cookies to cool. 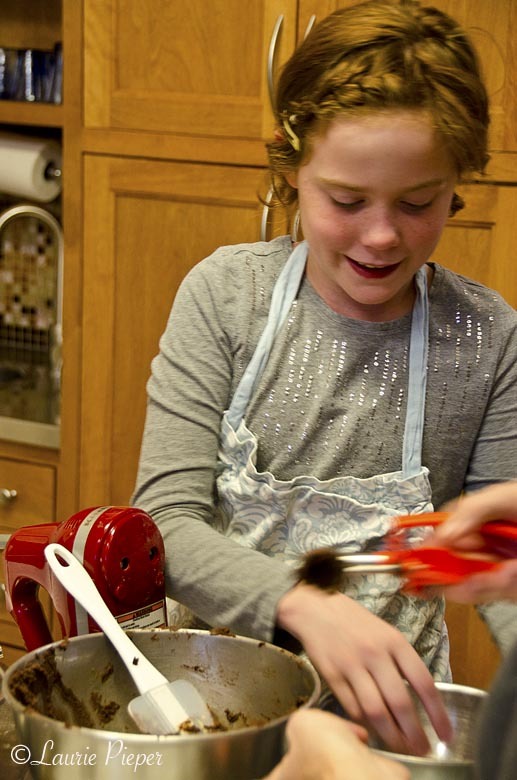 Once cool, whisk the spices into the remaining 1/2 c. of confectioner’s sugar. Roll the cookies in confectioner’s sugar mixture until well coated. Once you have rolled all of the cookies once, roll them in the mixture again until you have used all of it. To avoid getting finger prints in the cookies, transfer cookies to a serving plate or a storage container using a fork to lift them. 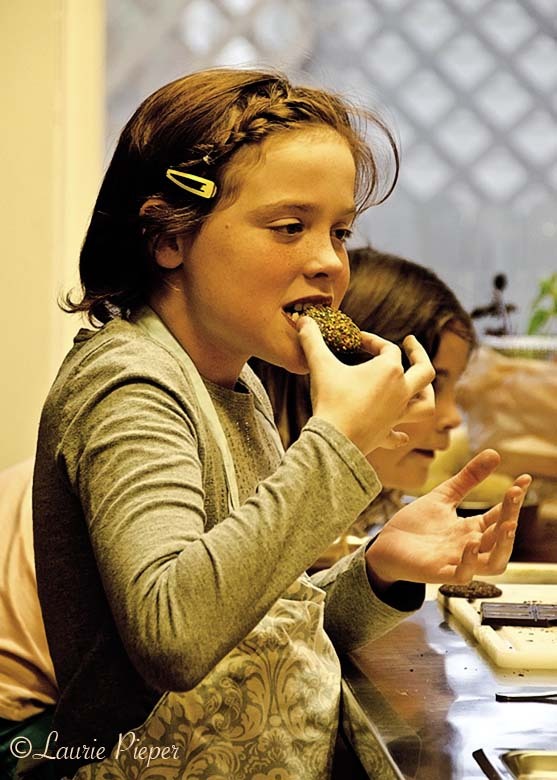 It was cold and dreary here today, so my friend Sara and her daughters came over to bake cookies. What a perfect afternoon to have the oven on … and the girls did a great job! Chocolaty sugar cookies with Andes’ Mints. Preheat oven to 325 degrees F. Line 4 baking sheets with parchment paper. Whisk together flour, cocoa, baking powder and baking soda. Set aside. In large bowl, beat together butter and sugars until light and fluffy. Beat in egg and then bourbon or vanilla extract. On lowest mixer speed, beat in dry ingredients and then mints. Scoop a rounded teaspoonful of dough, roll into a ball, roll in decorator’s sugar to completely coat and then place on baking sheet. Repeat, spacing balls of dough at least 2” apart. When the first baking sheet is filled, bake cookies for about 14 to 16 minutes or until just barely set. Meanwhile, finish rolling the remaining dough. As baking sheets come out of the oven, place them on wire racks and allow cookies to cool. 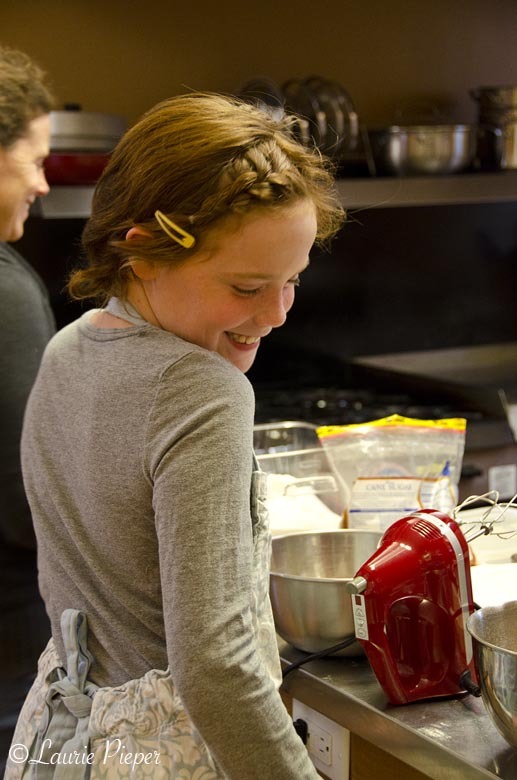 * Sparkling sugars are available through baking specialty companies such as King Arthur Flour and Wilton. For this recipe, I use white, green or gold sugar, depending on the occasion. Happy Baking! Have a great weekend! This is a very light, moist cake with a coarse crumb that is not overly sweet. Serve for breakfast with fresh fruit and yogurt or for afternoon tea. 2. In a small bowl, whisk together flour, baking powder and salt. Set aside. 3. In a medium bowl, beat butter until it is light and fluffy. Add granulated sugar and continue to beat for about 5 minutes or until the mixture is light and fluffy. Scrape sides of bowl. Add eggs, one at a time, beating well after each addition. Scrape sides of bowl. 4. Lightly beat in 1/3 of flour mixture, then 1/2 c. of buttermilk or milk. Scrape sides of bowl. Repeat, and then beat in the remaining flour mixture. 5. Fold pineapple into batter. Spoon batter into the prepared cake pan, using the back of the spoon to smooth and level top of batter. 6. Bake for about 40 minutes or until a cake tester inserted into the center tests clean. 7. Cool cake in pan on a wire rack for 10 minutes. Invert cake onto cake plate to serve right away or onto wire rack to continue cooling. Dust the cake with confectioner’s sugar before serving. Garnish as desired. 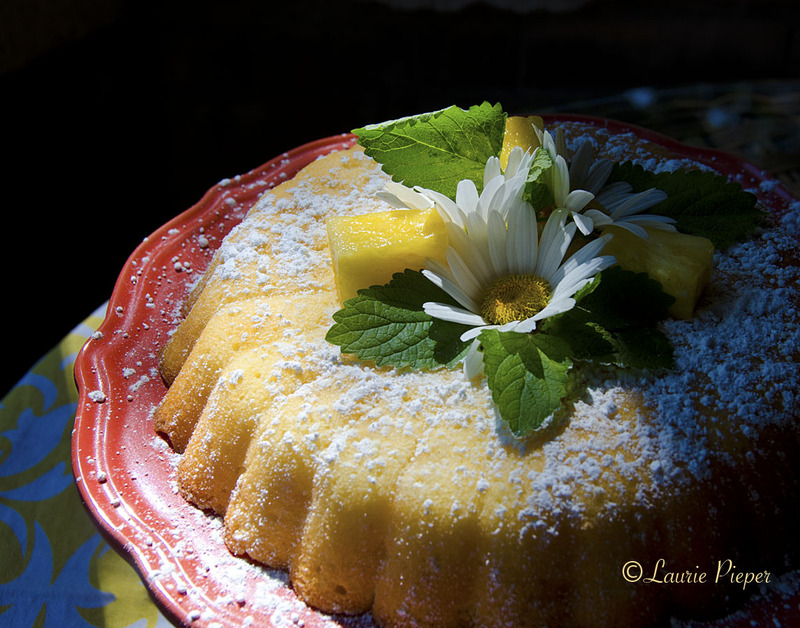 * Canned pineapple tidbits can be substituted in the recipe for fresh pineapple, if well-drained first. ** Daisies and lemon balm leaves are shown here. Daisies are edible and taste similar to parsley. So they are not very dessert-like in flavor, but they are a pretty garnish. 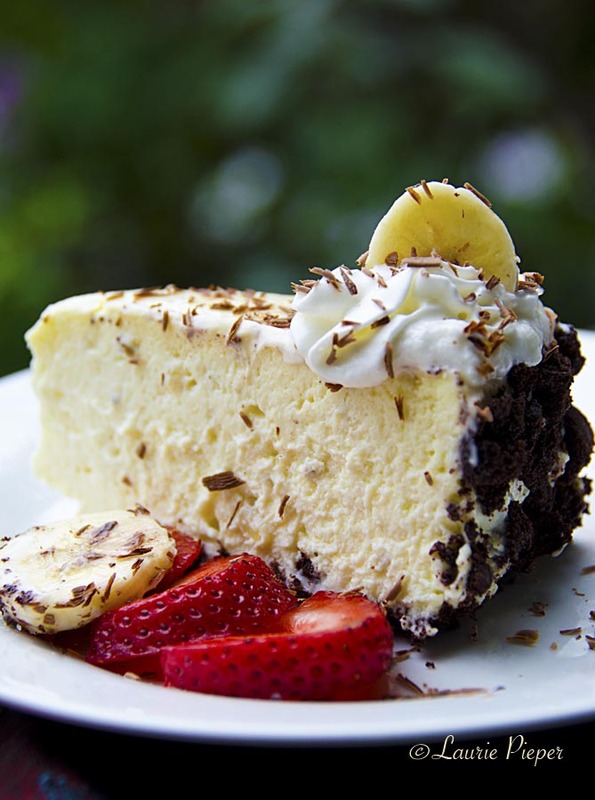 Happy National Cheesecake Day on July 30th! I decided to mark the occasion by making one of my favorite cheesecakes – Banana Chocolate Crumb Cheesecake! This is a soft, not-too-sweet, delicately flavored banana cheesecake with a dark chocolate cookie crumb “crust”. The custard recipe comes from Rose Levy Beranbaum’s banana variation of her Cordon Rose Cheesecake in The Cake Bible – a truly excellent cookbook. 1. Butter the inside of an 8″ springform pan. Cut a circle of parchment paper to fit the inside of the pan – just smaller than 8″ in diameter. Butter the paper and then place it in pan. 2. Wrap the outside of the pan with a double layer of heavy-duty aluminum foil to prevent seepage from the water bath. 3. Have ready a larger baking pan – I use a 9″-square brownie pan – to use as a water bath for baking the cheesecake. 2. Using a mixer or large food processor, beat together cream cheese and sugar until perfectly smooth. Scrape bowl. Beat in vanilla and salt, then sour cream. Scrape bowl. Mash bananas together with lemon juice. Beat bananas into custard. Scrape bowl. 3. Pour custard into prepared springform pan. Place pan in larger baking pan. Pour in 1″ of very hot water. Bake cheesecake for 45 minutes. Turn oven off, without opening the door, and leave cheesecake in oven for one hour. Remove cheesecake from oven and from water bath. Remove foil from pan. Plan pan on a cooling rack and let cheesecake continue cooling at room temperature for one more hour. Cover pan with plastic wrap. Chill cheesecake in refrigerator overnight. 1. The next day, wipe outside of cheesecake pan with a hot, damp towel. Run a thin spatula around the inside of the pan. Release the clasp on the springform pan and remove the outside of pan. If there is condensation on the cheesecake, lightly pat it dry with a paper towel. Invert cheesecake onto a flat plate or a small cutting board covered with plastic wrap. Remove parchment paper. 2. Pat cookie crumbs onto bottom and sides of cheesecake. Re-invert onto serving plate. Cover with plastic wrap and chill until serving. Garnish and serve. 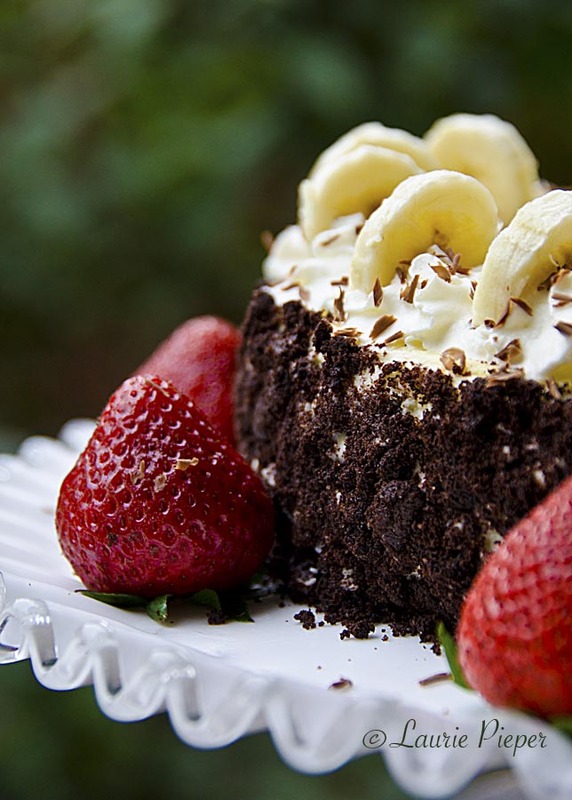 • Whipped cream, chocolate shavings and banana and/or strawberry slices. • Whipped cream and hot fudge. • Whipped cream and dark cherries. • For Banana Split Cheesecake, serve with whipped cream, banana slices, strawberry slices, pineapple chunks, chopped walnuts, chocolate sauce, and melted strawberry jam. Enjoy! Happy National Cheesecake Day!